See if we can answer it in our FAQs. Q: What is a house clearance? House clearance involves removing all contents from a property. Unlike other companies, we will reuse it, recycle it, donate to charity shops and sell on precious antiques – we value our customers’ contents. Q: What kinds of properties do you clear? All sorts! We clear full flats and houses, as well as garages, sheds and lofts. We cleared the Holy Trinity convent and school in Sundridge Park – it had 252 rooms in total! Q: How much will a house clearance cost? The cost is totally based on your property. We will only give costs once we have visited in person, to ensure our price is accurate. If you have valuable antiques, we will reduce our fees accordingly as we will be able to sell these on.  An average house clearance in Bromley will cost £500-£1,000. Read more about how we price our clearance jobs. Q: Are you Checkatrade approved? Yes – we are fully Checkatrade approved and have the highest possible rating from our customers. We have been vetted thoroughly to receive our approval – this is reassuring for our customers because our industry is renowned for fly tipping and irresponsible waste disposal. Q: Do I pay for a house clearance – or do you pay me for my house contents? This all depends on your property. If you have antiques that will be worth some money, we will reduce our fees, and in this case, we might end up paying you for your contents. In most instances, you will pay us a fee between £500 and £1,000 for our clearance services. This all depends on the work required. A probate valuation will usually only take a few hours, whereas a clearance will take longer. Our team remove ALL contents directly from the property as quickly as possible. Q: How long will it take to book in a valuation? We will book in your valuation ASAP. Just let us know a time that is convenient for you. Q: What insurance do you hold? We have £1 million public liability insurance and have 4 members of staff who are insured to work on your property. If there is anything else you would like to know, please do not hesitate to get in touch. We will answer your calls 7 days a week – get hold of us on 020 8777 4440.